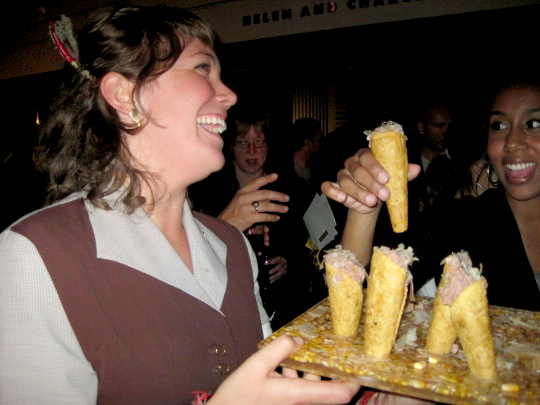 Left: Beef ice cream cones. Right: The crowd from above. Photo: Cammie Nguyen / Eat Me Daily. Saturday night, the San Francisco Museum of Modern Art was full of bizarre sights: bicyclists circled a group of people who had gathered to eat dishes such as beef ice cream cones while a poet screamed Italian poems into a megaphone, and the moos and howls of dying cows blared over the speakers. 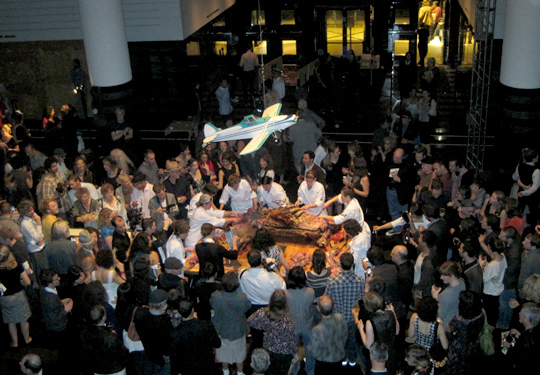 It was a Futurist banquet — "OPENfuture: Spinning Marinetti's Wheels" precisely — put on by OPENrestaurant, a collective of Chez Panisse restaurant staff, as part of the SFMOMA's current retrospective Metal + Machine + Manifesto = Futurism's First 100 Years. The inspiration was F.T. Marinetti’s 1932 Futurist Cookbook, a text that rejected fascist recipes and Italian culinary tradition (like pasta), favoring a more sustainable and artistic approach to food. 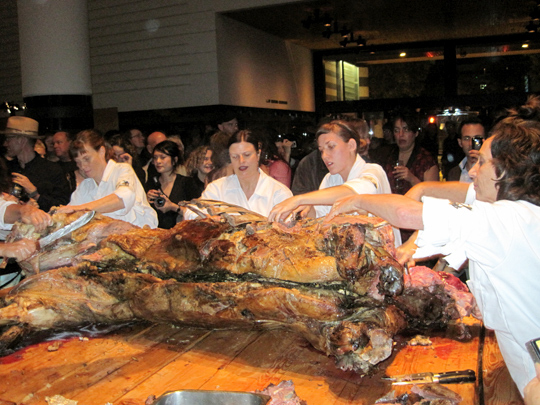 The main event was a whole 800 lb cow that had been spit-roasted for 18 hours the night before, bicycled through the city to the museum, then butchered by a team of all-female chefs. 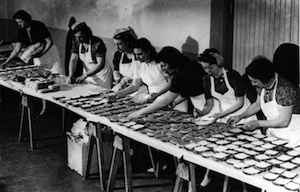 Amidst the eruption of cultish clapping, the slabs of beef were delivered by conveyer belt from the sacrificial table to the different food stations. 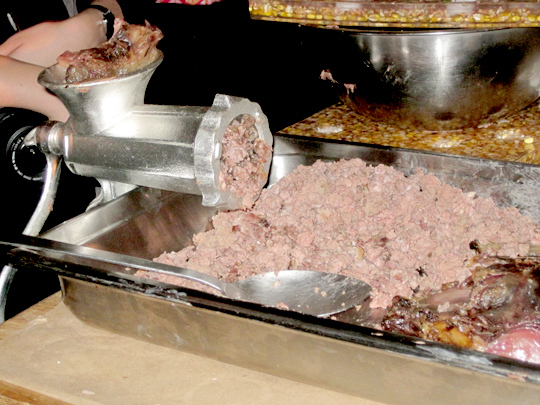 One of which ground up the beef using a hand-operated meat grinder, before stuffing it into fried corn tortillas, constructing beef ice cream cones. Beef ice cream cones served with a smile. Photo: Cammie Nguyen / Eat Me Daily. As the unsettling soundtrack featuring emergency sirens and faltering cow moos, moans, and screams played on, attendees’ senses feasted on uncomfortably constant motion. Clanging bells of bicyclists averting oncoming foot traffic rode the circumference of the venue, while jumbo screens depicted car and plane crashes, complete with morbid body extractions. An animated poet performed from different spots of the room with gusto in a foreign language, wielding a megaphone, followed by a remote controlled plane circling overhead, filming the chaos beneath. 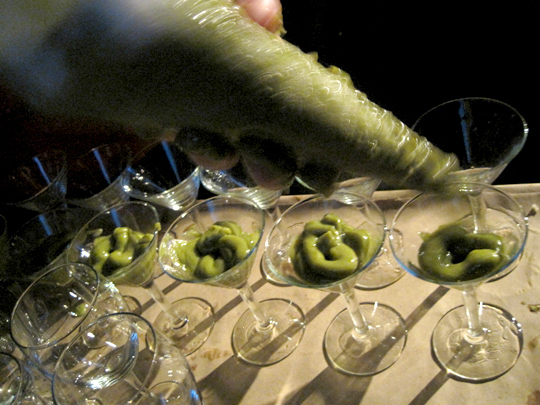 Wine was poured from gasoline canisters, avocado liqueur puree was served in martini glasses, while tasty beef bites were passed around. The banquet was brought to a close by the ceremonious mopping of the meat juices pooled on the floor post-butcher. Avocado puree cocktails in the making. Photo: Cammie Nguyen / Eat Me Daily. Left: Recitation performed by an ebullient poet. Right: Cyclist circling amongst the chaos. Photo: Cammie Nguyen / Eat Me Daily. The crowd looking on as the female chef staffers butcher the cow. Photo: Cammie Nguyen / Eat Me Daily. The chefs cutting into the cow carcass. Photo: Cammie Nguyen / Eat Me Daily. Live beef grinding for the "ice cream cones". Photo: Cammie Nguyen / Eat Me Daily. OPENfuture: Spinning Marinetti’s Wheels at SFMOMA from eatmedaily on Vimeo. Although I bet it doesn't taste quite the same, I think the creamy texture of the beef and the corn tortilla cone remind me of the Jack in the Box taco in all its 3 am glory. Wish I was there sounds like a surrealistically good time. How is it that Americans can't get that Marinetti was taking the piss? No need to answer....just look at the way Mr. Bully has sold the world.